It has come to my attention that I am late to another party. It’s not the black dress shoe party – just last week I replaced the ones I’d been wearing since 1987. It’s not the DVR party, because we upgraded to one of those when we moved houses last month. And I’m not talking about the iPhone party, either, though I’m still waiting for just the right moment to jump on that bandwagon. I’m talking about the sushi party. Though the term was already familiar to me, I faced sushi for the first time twenty-six years ago (not long after I bought the aforementioned black dress shoes.) The scene was a grocery store in Hawaii, the location of my summer job. My host, Geno, stopped at the supermarket on the way from my orientation to his house, where I would be staying for the next three weeks. There was sushi everywhere, but it wasn’t the kind of sushi I expected. This sushi was mostly rice in a seaweed wrapper. Where was the raw fish, I wondered? Over the course of those three weeks, I went on a culinary tour of Asian food that I would dearly love to repeat. Prior to the pick-up, I went with my orientation group to a Mongolian Barbecue place that I still remember fondly. With Geno I discovered delicious Chinese food that to this day I have yet to see on a mainland menu, Korean Barbecue (who knew? ), and Japanese tempura. It was at the Japanese restaurant that I truly began my sushi-cation. (That’s not a sushi vacation – I’m not quite ready for that yet – I’m talking sushi education.) Geno and his wife, Emiko, had already explained that sushi was more about the rice and the wrap, and that it may or may not include the raw fish I had long assumed was the essential ingredient. Raw fish, I learned, is actually called sashimi. While I crunched happily away on my tempura, Geno ordered a plate of sashimi and offered me a bite. I don’t think he actually double-dog-dared me, but I didn’t want to leave the island without at least trying it. I doubt I chewed it very long. More likely I treated it much as I do a raw oyster: heavy on the sauce and light on the tongue time. But I tried it. Check sashimi off the bait – er, bucket – list. Since that summer I could probably count on one hand the number of bites of sashimi I have had. In this same time period sushi (with or without sashimi) has become a sensation across America. My first encounter with something akin to a California roll was a couple of years ago here in Starkville at O.E.C. Japanese Express. I thought it was pretty good, and I was surprised to see all the ingredients that are going into sushi these days. Despite the positive experience, two years later I doubt I have had another bite. If I go to Umi and have to choose between sushi and hibachi, I’m going with hibachi. I get dinner and a show, and I love that ginger sauce on everything they throw at me – literally. It won’t surprise you, then, to hear that on a recent trip to Oxford for a show of another kind, I was a bit wary when College Buddy suggested we check out the new sushi place. But we have eaten together many times in the last few years and he has yet to lead me astray, so we agreed to meet him and his wife at Jinsei. Here’s the funny part. I didn’t order sushi. And there were plenty of options that actually included seafood that been properly battered and fried as the good Lord intended. Yet I did end up with two plates of raw meat. The Wife ordered nachos for the table. I thought this was a bit odd for a Japanese restaurant, though I am certainly not averse to going out on a culinary limb. 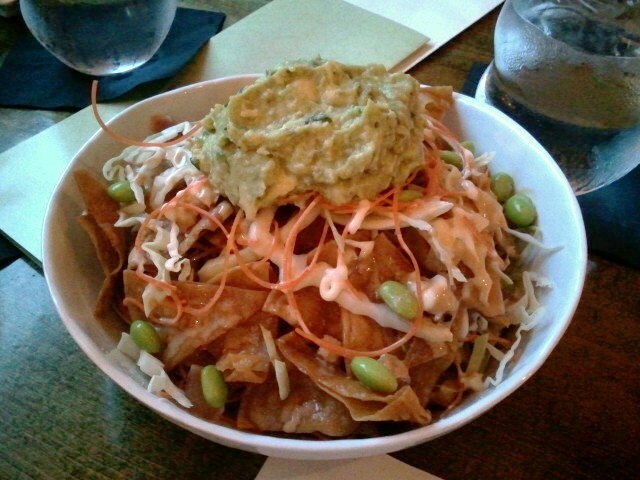 The chips were triangular and there was an adaptation of guacamole, but any similarities to Tex-Mex nachos ended there. This dish had shredded cabbage, carrots, edamame and little bits of barely-seared tuna. It took a little getting used to, but I ended up enthusiastically eating my fair share. College Buddy got a couple of fancy sushi rolls for dinner but I stuck with a hot dish. A very hot dish, in fact. 525 degrees, according to the server. 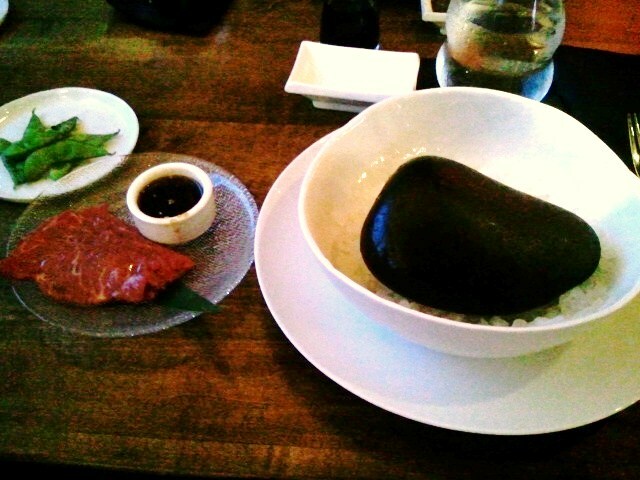 They called it River Rock Kobe, and it was the river rock, brought to the table on a bed of rock salt, that was so blooming hot. On a separate plate were about six thin slices of Kobe beef and a little dish of ponzu, a soy-based citrus sauce. This was a DIY dinner. I took a slice of Kobe, dipped it in the ponzu, and laid it on the rock a few seconds per side to cook it. There was smoke, there was sizzle, and it was delicious. Dinner and a show. I may not quite be inside the party just yet, but I’m working my way to the door. Maybe if Little Dooey would put together a little pulled pork, a crawfish tail, and a tempura-fried dill pickle inside some Cajun dirty rice, and roll it all up in a turnip green, it would be an easier transition. I’ve had an idea for a while, and a few weeks ago I got the ball rolling. My maternal grandmother – aka Granny, Miss Ruth, or Mrs. Etha Mann – turned 97 years old last June. At the Carrington Nursing Center last Mother’s Day, she was declared the oldest mother in the place and she was downright proud of that distinction. The idea was to pick her brain, essentially interviewing her about the kinds of foods her family ate and how they were procured and prepared back in the early part of the 20th century. Her memory slipped from time to time, but she could tell tales of her childhood and quote large volumes of poetry from her many years as an English teacher at Belmont High School. I figured she would easily be able to pull out some food stories from those days as well. When I mentioned this idea to her, she said something along the lines of “Oh, law…”, as if she wouldn’t be able to recall anything – then she launched immediately into a story. As a young girl, she told me, they would put butter in a bowl at the table and smooth it out so that it was perfectly rounded on top. When they had mashed potatoes, they prepared them in much the same way – rounded on top – and the two bowls looked almost exactly alike. As the story went, another little girl was visiting one day and Granny spotted a bowl of potatoes, told her friend it was butter, and proceeded to eat a big spoonful. Apparently this elicited the desired shock from the friend, and a gleeful giggle from Granny, then and now as she told me the story. I’m thankful that I got that story, because she left this world just a few days after that visit. I will remember her for a lot of things – calling me Dr. Pudding Reed (and by admitting this publicly I am NOT giving any of you permission to call me that), correcting my grammar and pronunciation on a regular basis, making sure I knew she “loved me good” – and food stories that I didn’t have to ask about because I was there. I may have told a few of these stories before, in some form or fashion, but this time I think it’s okay – Granny liked to tell the same stories over and over again, too. Granny was known first and foremost in the family for her iced tea. It wasn’t anything fancy, but it did approach addictive. Three or four family-sized tea bags, a small can of frozen lemonade, and at least a cup of sugar – that’s the basic recipe for a gallon of tart-sweet joy. These days it is harder to find the smaller can of lemonade, and I suspect she put more than a cup of sugar in there most of the time, but the key ratios are there. A few years back several of us in the family met for a pre-game tailgate at Hotty Toddy U, and as has been known to happen in the Grove, there was family silver on the table. We only had one token piece – a silver pitcher full of Granny’s tea – perfectly appropriate for the occasion. And I have some in my refrigerator now. Beyond the family she became somewhat famous for her fish fries. Until recent years when she was unable to navigate the kitchen as well as before, I can remember very few visits when we did not have fried fish, hushpuppies and slaw at least once. 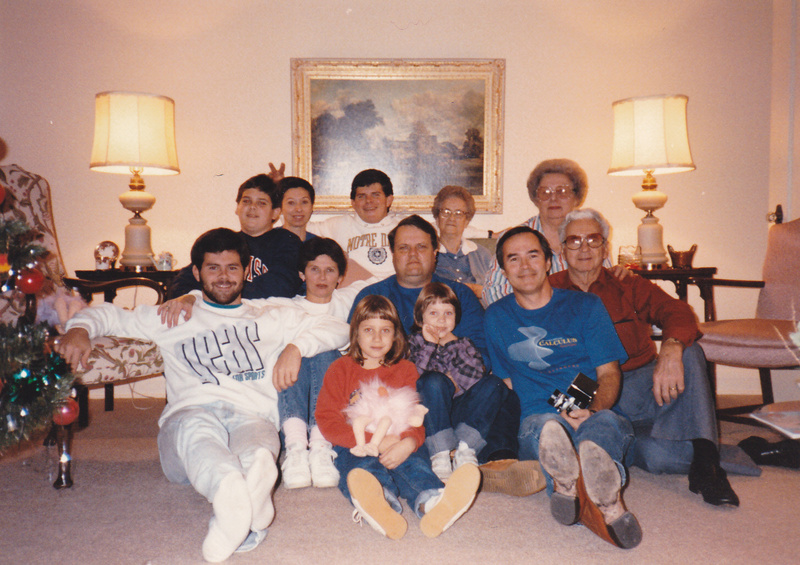 Oftentimes we were involved in catching the fish – bream or catfish, usually – after which we would sit on the back porch with my grandfather, Pappy, and clean them. Okay, we would watch him clean them. What we didn’t eat would be dropped into empty milk cartons, filled with water, and frozen until we visited again. She cut the whole catfish on each side so that you could easily pull off a bite at a time with your fingers. At her table I learned to enjoy the salty crunch of a fried fish tail. And if I ever master her hush puppies, I will know I have arrived. There were always lots of desserts to choose from, and Granny was almost always thinking of me when she made them. As a child and on into early adulthood, I would not get near coconut or pecans. (The coconut is still abhorrent to me, but I have learned to tolerate and even enjoy pecans in some forms.) If she was making something with pecans in the recipe, and it was possible to do so, she would make half with nuts and half without. Chocolate sheath cake in particular was always lumpy on their side, smooth on mine. She made a great caramel cake, too, and that is no easy feat. 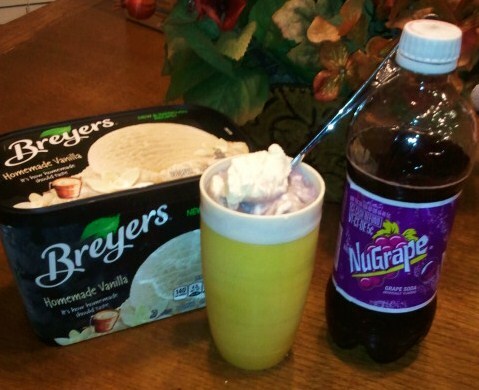 The penultimate dessert at Granny’s house, however, was the Purple Cow: Nugrape soda over vanilla ice cream, preferably in a Therm-O-Ware tumbler. Granny also brought food into the little sayings she would repeat now and again. If someone complained, “If I just had this, then I would do that” her automatic reply was, “If I had some ham, I could have some ham and eggs, if I had some eggs.” I confess I have adopted that one. Granny was bedridden for the last two years, so she hadn’t sat at the Thanksgiving table in a while, but we’d still take her a little plate and spend some time at her side. This Thursday I expect it’ll be a little tough for us, but we know she is feasting at a spectacular table, one that she can walk to on her own power, where she won’t have to worry about her sugar level, and with Pappy at her side, who’ll be happy to take his dessert right in that little puddle of pot liquor on his dinner plate, thank you very much.